As money is an indispensable part of people’s lives, it is a good medium through which we can better understand a culture. In my blog post dated 6 May 2017, I have talked about the stories behind the Korean banknotes which are related to people who have made significant contribution to the Korean culture. On the other hand, you may better understand the development of a culture by studying the history of development of money used by it. 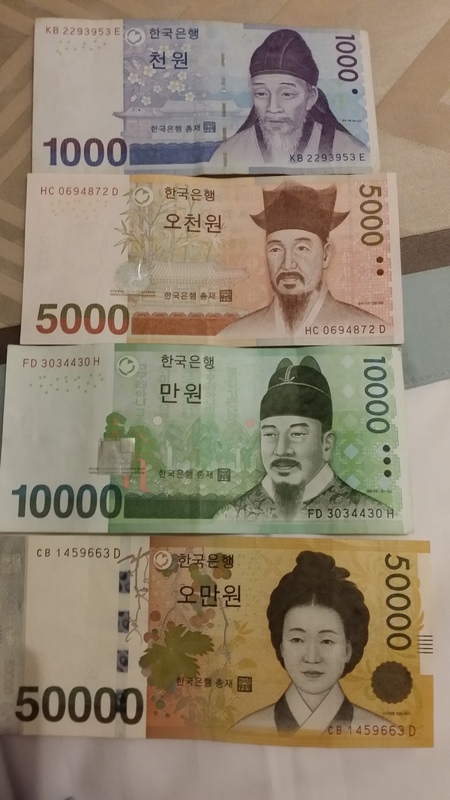 In South Korea, there are two museums to which you may go to better understand the development of Korean money. ZONE 4 – This zone displays the currency of Korea from ancient times to modern days. There are also rare currencies from around the world on display here. You may try to see if you can find the currency of your own country here. You can have a quick tour of the Bank of Korea Museum by watching this video. Please note the museum is closed on Mondays and certain public holidays. The Currency Museum of Korea is located in Daejeon, which is about 50 minutes by KTX train from Seoul. The museum has a collection of about 120,000 pieces, e.g., coins from ancient times to modern days (including Korean, Chinese, Roman and Greek coins), commemorative coins, postage stamps, medals, and currencies from over 120 different countries (it’s highly likely that you will find the currency of your own country here). You can find some interesting ancient coins like shell money, fish-shaped coins and sword-shaped coins here. There are also exhibitions displaying a wide variety of banknotes and explaining the production process of a banknote and the security features. You can have a quick tour of this museum by watching this video (with English sub-titles). Please note that this museum is closed on Mondays and public holidays.